We’ve gathered the most frequently asked questions about the OLC Digital Learning Innovation Award, including details about the Bill & Melinda Gates Foundation Grant which has provided funding for the award. If you still have a question, let us know by using the contact form on this page. Why was OLC awarded a grant by the Bill & Melinda Gates Foundation? OLC was awarded this grant after presenting its unique approach, resources and expertise in advancing teaching and learning methods and research. In collaboration with the higher education community, OLC is well positioned to drive meaningful change and innovation to help to close the degree completion gap in the United States. OLC has extensive experience in research, pedagogy, and best practices, with a dedication to a continuous quality improvement approach. It is a respected and credible source of information as well as a trusted advisor. The OLC Quality Scorecard is one of the major tools used to evaluate and improve online learning programs, and has been adopted by hundreds of institutions. What is the size/value of the grant? The grant is valued at $2.5 million for three years. What does this grant mean for OLC and its community? This grant is in keeping with the vision of OLC to set the global standard in online learning. It will help OLC advance a number of key initiatives intended to showcase exemplary practices in today’s higher education institutions and accelerate innovation. What does OLC intend to do with the grant funding? Digital Learning Innovation Award. Recognizing and rewarding exemplary institutions and faculty-led teams in their effective use of digital courseware. Specifically, the grant will fund a new award competition, which is accompanied by a meaningful monetary commitment. OLC Quality Scorecard Expansion. Evolving and expanding the OLC Quality Scorecard suite to include a digital courseware ancillary scorecard. How wide is the degree completion gap between economically privileged and low-income students in the US? The “Indicators of Equity Report” (2015) highlights that 77% of students from the wealthiest families currently earn bachelor’s degrees by age 24, in contrast to only 9% of students from the lowest-income families. In the last 35 years, the number of wealthy students obtaining bachelor’s degrees has grown dramatically (from 44% to 77%), but for low-income students it has only inched up three percentage points (from 6% to 9%). One area identified as a particular barrier to these students’ success is general education courses usually taken during the first or second year of college. OLC’s grant-funded initiatives seek to address this specific area. What is the role of the OLC Advisory Committee? OLC has convened a group of representative stakeholders from across the higher education landscape to act as thinkers, strategists and visionaries during the DLIAward implementation and deployment phases. For more information, see the DLIA Leadership and Support Team. Our working definition as outlined in the key definitions is Digital courseware is instructional content that is scoped and sequenced to support delivery of an entire course through purpose-built software. It includes assessment to inform personalization of instruction and is equipped for adoption across a range of institutional types and learning environments. OLC recognizes that research and institutional exploration around the use of digital courseware is still evolving. OLC believes it is important, through this award, to support best practices in teaching and learning with the use of technology. Can you provide examples of digital courseware? *This is not intended to be a complete or comprehensive listing of the platforms, apps and tools comprising digital courseware, nor is it intended to be an endorsement of any of these products by the Online Learning Consortium. Is it a requirement to select a digital courseware solution from the above list? Courseware solutions are not limited to the list, however, the digital courseware must conform to the working definition as provided above. What is the Courseware in Context (CWiC) framework? The Courseware in Context (CWiC) framework is an evolving framework developed in order to help institutional and industry stakeholders understand and differentiate between courseware offerings. The Taxonomy includes nine courseware capabilities, courseware delivery platform capabilities and a series of essential capabilities which are referenced as table stake capabilities. Why is adoption of digital courseware important? There is a widening gap in degree attainment between economically privileged and low-income students. OLC recognizes that this is a result of multiple variables including K-12 preparation, socioeconomics, as well as academics. While a holistic view is needed, through these awards the OLC community will be better informed about the role of digital courseware in helping close this outcomes gap. Are you looking for emerging technologies, or something more established and tested? With a focus on teaching and learning, OLC is looking for highly interactive solutions and/or pedagogies that are making a positive impact on the success of underrepresented students. Whether it is an emerging technology or something more established and tested, award applications can include the range between both ends of the spectrum. 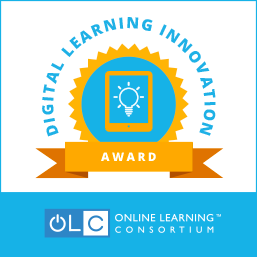 What is the OLC Digital Learning Innovation Award? The OLC Digital Learning Innovation Award (#DLIAward) is an award that recognizes and rewards the exemplary use of digital courseware to improve student success, especially among minority, first-generation and other underrepresented student groups. With a focused lens on increasing the number of undergraduate students who complete foundation or gateway courses, the award will recognize projects that inspire innovation, increase access, support implementation, improve outcomes, enable accessibility, and promote sustainability in the use of digital courseware. The awards are accompanied by meaningful monetary rewards: $100,000 for up to three institutions per year and $10,000 for up to 10 faculty-led teams per year, signifying the extraordinary level of advancement and impact on the adoption of digital courseware that is being recognized. What is the difference between a grant and an award? A grant funds a proposed project that has not yet begun. An award recognizes excellence in a project during the implementation or maturity phases. The OLC DLIAward is designed to focus on teaching and learning with a special emphasis on student success for underrepresented, low-income and first-generation students. How does the OLC Digital Learning Innovation Award differ from other OLC Awards? The OLC Digital Learning Innovation Award, which focuses on how students learn while advancing student success through the adoption of digital courseware, will complement the annual OLC Awards, which offer recognition of excellence in online teaching and learning across a range of categories, such as leadership, faculty development, research and overall excellence. The new award competition is distinctly focused on teaching and learning using digital courseware, unlike existing OLC awards. The monetary reward is higher than any ever awarded by OLC. The award value is $100,000 for institutions and $10,000 for faculty-led teams, signifying the extraordinary level of advancement and impact on the adoption of digital courseware that is being recognized. The OLC Awards have recognized outstanding work in the field of online education since 2001. The new award competition will be conducted annually over a three-year period beginning in 2016, with awards being made in 2016, 2017 and 2018. Do all higher educations institutions qualify to submit an application? Applications will be accepted from any accredited higher education institution based in the United States. Refer to the Council for Higher Education Accreditation (CHEA) for a complete listing of accrediting organizations. The Digital Learning Innovation Award (DLIAward) was granted through the Bill & Melinda Gates Foundation Postsecondary Success Program. The Postsecondary Success Program aims to help U.S. higher education become more personalized, flexible, clear, and affordable. As the focus of the funding is U.S. higher education, so is the focus of the OLC DLIAward. What if my institution is located within a US territory? Applications will be accepted from any accredited higher education institution based within the United States; however, this does not include the United States territories and possessions. Does my institution need to be a member of the Online Learning Consortium to apply? No, your institution does not need to be a member of the OLC to apply. Applications will be accepted from member and non-member institutions and faculty-led teams. We hope your institution will see the value of the Online Learning Consortium in providing an extensive set of resources for professional development and institutional advancement of online learning, including, original research, leading-edge instruction, best-practice publications and quality frameworks, community-driven conferences and expert guidance and consider membership. Click here for more information. Is this only for fully online coursework, or can a model including blended learning be eligible? Despite our name, OLC as an organization has long had an interest in blended learning. Applications will be accepted from faculty-led teams or institutions which focus on blended learning solutions. How do you define gateway/general education/foundation courses? Gateway courses, also referred to as general education, liberal studies, or foundation courses, are designated at a campus or institution as the first set of courses a new undergraduate student will enroll in. These courses may be called something totally different depending upon the institution. Regardless of how they are labeled, the intent is that students must complete these courses before they can move to more advanced coursework. It is often this set of courses for which students may be placed in developmental sections (e.g., English, math). There are two award categories, what's the difference? Award categories include the Institutional Award and the Faculty-Led Team Award. Applications will be received through the same submission process and timeline for these two different categories of awards. Faculty-Led Team Award – This award is designed to recognize a small group of innovators within an institution who may be the first to adopt digital courseware at their institution. Adoption may be at the course or program level. At least one faculty member must be a member of the team. Institutional Award – This award is designed to recognize institutions that are making an institution-wide commitment across multiple courses and/or programs to adopt digital courseware to reduce barriers to academic success for underrepresented students. Will submissions be considered if they don't benefit the ENTIRE institution? While there are two award categories (the faculty-led team and institutional), it is incumbent upon the submitter to determine which category is appropriate for their application. OLC recognizes that an entire institution may not benefit from a particular initiative. The key words in the institutional award “institution-wide commitment across multiple courses and/or programs” may be helpful in determining the ‘tipping point’ between the faculty-led team award and the institutional award. Can my institution apply for both the Institutional Award and the Faculty-Led Team Award? No, an institution may not apply for both the Institutional Award and a Faculty-Led Team Award. However, it is possible for more than one faculty-led team from the same institution to apply. OLC recognizes that innovation can happen within different colleges/departments/programs within an institution, and OLC does not wish to limit the number of unique award applications driven by faculty-led teams from a single institution. It may be possible for a single institution to receive more than one faculty-led team award within an award year. Digital Learning Innovation Awards will be presented in 2016, 2017 and 2018. What if an institution applies, but a faculty-led team application has already been received? Will we be notified? OLC recognizes that given the size and organizational structure on some campuses, that it may not be possible to coordinate applications. OLC will monitor award applications and will notify an institution if both an institutional award application and a faculty-led team application are both submitted. As indicated above, the same institution can submit more than one faculty-led team award in the same year. Can a state-wide consortium or group of institutions apply for the institutional award if they are working on an initiative/project together? OLC will accept applications from state-wide consortia or groups of institutions who are working on a project/initiative together. Please note that this would limit those institutions involved in the joint application from applying as an individual institution and it would limit the ability of faculty-led teams from those institutions applying. Do only undergraduate courses/programs that implement digital courseware qualify for the award? Yes, this award is for undergraduate courses/programs at colleges and universities, specifically, the gateway or foundation courses typically sequenced early in the undergraduate program. Community colleges, 2-year technical colleges, or 4-year undergraduate programs all qualify for these awards. While OLC recognizes that many graduate programs are engaged in innovative teaching and learning approaches, this award is designed specifically to recognize efforts at the undergraduate level. Are these awards limited to courses/programs for traditional students? Or can the audience also include adult learners? The focus of this award is on supporting first-generation, low-income, underrepresented students no matter their age. Applications will be accepted from faculty-led teams and institutions which focus on student success in undergraduate foundation courses (depending upon the institution they may also be referred to as general education, liberal studies, or gateway courses). Applications that include full and/or part-time traditional aged undergraduates, military personnel or adult learners will be accepted. Would first-year experience or ESL courses that help prepare students for gateway courses be eligible? Yes, if those experiences support student success and degree completion. What criteria should be included in the award application? The award application provides additional detail. How are the criteria scored? Be sure to refer to the evaluation rubric for more information about the scoring criteria. The evaluation rubric includes a number of guiding questions in each of the eight project impact areas to assist applicants in framing responses. Evaluation and scoring results will not be released to applicants. How are the award applications submitted? All award applications must be submitted using the electronic submission portal located here: http://awards.onlinelearningconsortium.org/awds/. The portal opened on May 22, 2018 and will remain open until July 31, 2018 at 12:00 p.m. PDT. No late submissions will be considered. What will I experience when I get to the application submission portal? Prior to this last stage, changes can be made to the application. The application submission portal shows your progress toward completion of each of these stages. What are the features of the application submission portal? Applicants will have the ability to enter and exit the platform, saving their work as they develop their application. The platform allows for cutting and pasting from other documents into the application. Applicants are able to print a copy of their application. Can we submit an application via a ‘paper-based’ method or do we need to use the electronic submission process? Award applications will only be accepted when submitted using the electronic submission portal by the stated deadline of July 31, 2018 at 12:00 p.m. PDT. It is important to note that no late submissions will be accepted. How will award submissions be evaluated? Each application will be evaluated using the evaluation rubric provided. The Online Learning Consortium reserves the right to communicate with finalists in the event additional information is needed to finalize judging. Who is judging the submissions for the OLC Digital Learning Innovation Award? OLC will announce the reviewers and the panel of judges for the 2018 OLC Digital Learning Innovation Award later this summer. A multi-tiered review process will be used. A team of trained reviewers will initially review and score the applications in each award category. Based on scores from the evaluation rubric, a smaller number of applications will move forward for review and scoring by a panel of judges. Reviewers and judges will be recognized individuals within the higher education community with relevant experience in the field. However, if they are affiliated with a US-based higher education institution, they can’t have either a faculty-led team application or an institutional application under review from their institution. All decisions made by the panel of judges are final. Each year, up to three institutional applications and up to 10 faculty-led team applications may be recognized with an OLC Digital Learning Innovation Award. At the discretion of the panel of judges, honorable mentions may also be recognized. Honorable mentions do not receive a monetary award as part of the recognition. Being named an honorable mention does not impact on any future award submissions from the institution or a faculty-led team. When will the winners of the OLC Digital Learning Innovation Award be announced? The award competition will be conducted in 2016, 2017 and 2018. Winners will be announced at the annual OLC Accelerate Conference in each of those years. What is expected of the award winners? Educate – Recognizing that this award is about teaching and learning using digital courseware, award recipients will be expected to share lessons learned and other insights with the broader community. Through the preparation of white papers and other efforts, OLC supports this learning process. Participate – Through webinars, conference presentations and other venues, award recipients will showcase their projects. Accept – At least one member of the winning team will attend the OLC Accelerate Conference in Orlando November 14-16, 2018 to accept the award. The grant will provide a stipend for travel, hotel, conference registration and an award luncheon registration for one member of the application team. Additional team members are welcome to attend the award luncheon and be recognized at their own expense. Sustain – The goal of this award is to recognize institutions and faculty-led teams who are influencing advancements in teaching and learning methods and research. The intent of OLC awarding this monetary commitment is that recipients will continue driving meaningful change and innovation over time. OLC will be working with recipients and the larger community to envision the best methods for sharing insights and resources as well as engaging communities of practice. How can the monetary award be used? As stated previously, an award recognizes excellence in a project during the development, implementation or maturity phases.The OLC DLIAward is designed to focus on teaching and learning with a special emphasis on student success for underrepresented, low-income and first-generation students. While OLC does not specify the uses of the monetary award, faculty-led teams and institutions should utilize the monetary award to continue driving meaningful change and innovation on their campus. For example, supporting faculty development initiatives may propel meaningful change efforts forward on a campus. The same may be said for offsetting student tuition in some way. Can we resubmit the following year if we are not recognized as an award recipient, or if we receive an honorable mention? Yes, OLC encourages applicants who do not receive an award with their submission to submit in a subsequent year. We are not ready to submit an application this year, can we submit next year? Yes, OLC understands that faculty-led teams and institutions may be at varying stages of readiness to submit an application this first year. If the decision is made not to apply this year, OLC encourages applicants to consider a submission next year. OLC reserves the right to modify the application criteria and evaluation rubric from year-to-year. In February 2017 and 2018, OLC will release award information and any updates to the application criteria and evaluation rubric. What is the OLC Quality Scorecard? Since its founding, the Online Learning Consortium has had a focus on quality. From the Five Pillars of Quality Online Education to the OLC Quality Scorecard, OLC is the go-to resource for tools and effective practice insights concerning online course/program quality. How does OLC plan to expand the Quality Scorecard? OLC will expand the Quality Scorecard suite with a digital courseware ancillary scorecard that will include the steps needed to identify, measure and quantify elements that define quality within an online education program, with a focus on attributes which result in a positive impact on student success, especially for students from underrepresented, first-generation, low-income or other disadvantaged backgrounds. When should I anticipate seeing something about the digital courseware and the quality scorecard? OLC will announce specific plans for evolving and expanding the Quality Scorecard in mid-2017. Any institution that is able to distribute federal financial aid as a result of its accreditation status. Community college districts or state systems can submit multiple applications if institutions are separately accredited. All award applications must be submitted through an electronic application submission portal by the deadline stated – July 31st 2018 at 12:00 p.m. PDT. Late applications will not be reviewed. To access to the electronic application submission portal, go to: awards.onlinelearningconsortium.org. Award categories include the Institutional Award and the Faculty-Led Team Award. Applications will be received through the same submission process and timeline for two different categories of awards. Faculty-Led Team Award This award is designed to recognize a small group of innovators within an institution who may be the first to adopt digital courseware at their institution. Adoption may be at the course or program level. At least one faculty member must be a member of the team. Institutional Award This award is designed to recognize institutions who are making an institution-wide commitment across multiple courses and/or programs to adopt digital courseware to reduce barriers to academic success for underrepresented students. Applications will be accepted from any accredited US-based higher education institution. Applications which focus on the following will receive highest priority: improving student success, especially among minority, first-generation and other disadvantaged student groups; utilizing a focused lens on digital courseware for general education or gateway courses; showcasing impact through an effective use of digital courseware. Educational software that enhances curriculum and provides innovative teaching approaches based on the science of learning and best practices in user experience (UX) design. This might include adaptive digital learning tools, including software that supports student learning such as games, apps, simulations and other personalized content. An evolving framework developed in order to help institutional and industry stakeholders understand and differentiate between courseware offerings. The taxonomy includes nine courseware capabilities, courseware delivery platform capabilities and a series of essential capabilities which are referenced as table stake capabilities. An organization or company that provides and supports a digital courseware solution. A set of standard measures established to evaluate the degree to which applications meet award criteria. A foundational framework used by judges to review and consistently score applications. Project impact will be evaluated on eight areas including: access, accountability, adoption/scale, affordability, interoperability/implementation, innovation, organizational learning, and quality. Courses designated at a campus or institution as the first set of courses a new student will enroll in. These courses may be called general education courses, liberal studies courses, foundation courses, gateway courses or something totally different depending upon the institution. The intent of these courses, whatever they are called, is that students must complete these courses before they can move to more advanced coursework. It is often this set of courses for which students may be placed in developmental sections (e.g., English, math). A primary focus of this award is to support the educational success among low-income, underrepresented, and first-generation students. A student whose parent(s)/legal guardian(s) have not completed a bachelor’s degree. This means the student is the first in their family to attend a college/university. An individual whose family’s taxable income for the preceding year did not exceed 150 percent of the poverty level amount. This includes those with family income levels that qualify the student for Pell grants or other need-based financial aid. Individuals who are members of racial or ethnic groups traditionally underrepresented or disproportionately lower in number relative to their number in the general population including African American, Hispanic, Native American, and Pacific Islanders. The ability of the faculty-led team or institution to continue the pace of digital courseware adoption on their campus or within their institution. The application submission Portal is now open: click here to start the submission process today.